On Halloween day this year, we did one of my all-time favorite tasks; planting garlic. This is such a fun job that, each year, reminds me why I farm. It’s a 9 month process that begins in October with the planting, and ends in July with the harvesting. Some would say that the garlic ritual begins in July, really, when we harvest out all the garlic, and set it up in the greenhouse to cure. 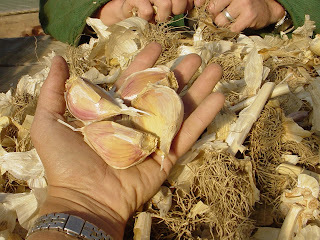 After that is complete – sometime in August or September, we set aside the heads that we want to use for seed garlic. We have been growing an unknown variety of hard-neck garlic for the past 5 years, and we’ve been selecting the seed for large cloves – this has resulted in heads with mostly 4 mega cloves each! They are fantastically mild, easy to peel, and store relatively well – we make it through about April or May before the quality of the cloves starts to deteriorate. This year we set aside an estimated 3000 cloves for planting. We are re-orienting our fields to run East-West next year instead of North-South; this will allow our beds to be shorter and easier to manage. A couple of the beds got some straw for mulching, but for the first year ever, we’ve got no straw to mulch with and will not be mulching the other rows. 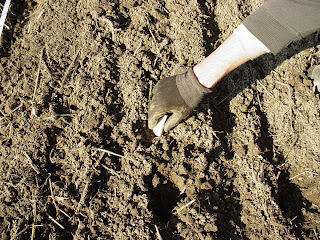 We’ve talked with many farmers that have not mulched garlic and had fine crops. So, we’ll see! First, we separate all the cloves in the heads. We sure had a lot! Here’s the size of these amazing cloves! Spencer used our BCS walk-behind 30″ tiller to prep the beds. The soil was so soft and fluffy that we didn’t need to poke holes to plant the garlic into, we were able to just shove them in! We have 5 beds, and about 3000 cloves that will turn into big beautiful heads of garlic next year! Spence throwing straw onto the beds. Mash together garlic and chiles using a mortar and pestle or the flat side of a large knife. Heat oil in a wok or large skillet over medium-high heat. Add garlic mixture. Cook, stirring constantly, until garlic is just golden, about 20 seconds. Add chicken; cook, stirring often, until chicken is cooked through, about 4 minutes. Stir in fish sauce, soy sauce, sugar, and 1 1/2 teaspoons pepper. Add basil; cook, stirring constantly, 1 minute. Season with more pepper, if desired. Serve over rice. Garnish with basil.